KIEV, Ukraine -- Ukraine's president has set out proposals for a peace plan for eastern Ukraine involving a unilateral ceasefire by government forces. 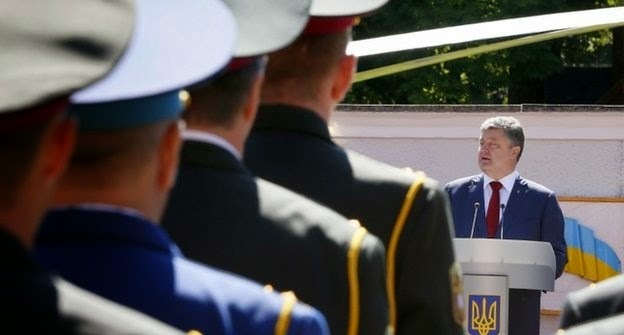 Petro Poroshenko spoke about his plans for a ceasefire at a military graduation ceremony. Petro Poroshenko said the temporary truce - expected "in hours or days" - would allow pro-Russian militants in the region to lay down their arms. One separatist group has already rejected the proposal. Mr Poroshenko's comments come after he held a phone conversation with Russian President Vladimir Putin. They discussed a solution to the crisis in eastern Ukraine, where pro-Russian rebels are battling government forces. More than 30 gunmen were killed and wounded in fighting near the town of Shchastya in the Luhansk region on Tuesday, a spokesman for the government's "anti-terrorism operation" said. Kiev also said that 147 Ukrainian military personnel had been killed and 267 injured in fighting since March. UN human rights investigators say the security situation in the Donetsk and Luhansk regions has deteriorated significantly over the past month. A report revealed a rising number of abductions and killings, with civilians increasingly caught in the crossfire and thousands forced to flee the violence. Meanwhile, Ukraine's Interior Minister Arsen Avakov has said an explosion at a major pipeline in central Ukraine was caused by a bomb. He said explosives had been placed under a concrete support at the Urengoy-Pomary-Uzhgorod Pipeline. No-one was reported injured by the blast. European and Russian companies said gas exports were not affected by Tuesday's pipeline explosion. Speaking at a graduation ceremony at the National University of Defence in Kiev, Mr Poroshenko said a "brief" truce would be introduced to allow "Russian mercenaries" to leave Ukraine. "The peace plan begins with my order for a unilateral ceasefire," Mr Poroshenko announced on Wednesday. "We expect that disarmament of military groups and restoration of order will take place right after it." The president added that his peace plan would have 14 points, including the closure of the Ukrainian-Russian border and changes to the constitution to give more power to the regions. A presidential spokesman told the BBC the ceasefire could be announced in "hours or days" but gave no further details. But Denis Pushilin, one of the leaders of the self-declared Donetsk People's Republic, a breakaway area which has asked to join Russia, rejected the proposal for the rebels to lay down their arms, Russia's TV channel Dozhd reports. Mr Poroshenko also said Russia was waging "a new type of warfare" with the use of professional subversive groups and volunteers. The Kremlin confirmed that Mr Poroshenko and Mr Putin "touched upon" the issue of a possible ceasefire during their talks on Tuesday, but gave no details. Meanwhile Russia says it has launched a criminal investigation into Ukraine's interior minister and a local governor over the killings of civilians and journalists. Mr Avakov and Ihor Kolomoisky, governor of Dnipropetrovsk, are accused of organising military operations, including rocket strikes, in cities such as Donetsk, Sloviansk and Mariupol that left more than 100 dead, Russian state media said.